So, it took a while, but finally, after a month or so, my experimentation with making an Artscow deck came in. For whatever reason, Artscow.com seems to have become the standard bearer for print-it-on-your-own card games and decks on boardgamegeek. Even having the need to use Artscow specifically for a few contests people are running there. I'm not really sure why this is; I've had reports of other places doing it cheaper, or more efficiently, or whatever. It's not that they are bad or anything. They have rotating daily (or even hourly) specials, so that helps. Also, they have a pretty nice interface for uploading cards through the use of Silverlight. 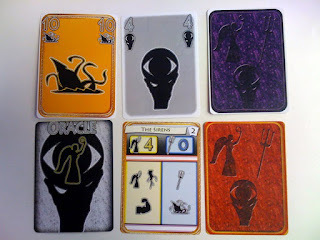 It is the first place I've seen that let's you create a deck cards where you can specify different card backs for each card, which is exceptionally nice when you are doing odd ball deck sizes, or smaller, differently handled decks (as such that I was playing with). Anyway, the biggest issues I've found are with the fact that cutlines supplied with the image importer don't really correspond nicely to the actual cutting edges of the cards. Looking at the top row of cards in the lousy photograph over here to the left, given enough whitespace along the edges, and they look great. However, bleeding out the images to full size is less-than-stellar, due to the over-growth of the images in relation to the physical cut lines. The text on the "Oracle" card even got chopped a bit off the top. The other two cards have a second ornamental bezel applied around the edge, which got severely cut (you can see traces of the extra bezel in the corners. Otherwise, the cards are a bit flimsier than your standard poker deck; I am not well-versed enough in printing productions to know if this is because of the plastic coating or paper thickness. The actual edge cuts are nice and crisp; even though I know of someone else who had small complaints about the cutting. As far as prototyping goes, they are perfectly fine and feel and look "real" enough to fool your friends and family. I've been playing a play-by-forum game of Battlestar Galactica on boardgamegeek. Granted, it's been painful at times. While not a complicated game, it has a lot of issues with regards to players interacting with each other with card play and dice rolls and such on each others turns, and so pretty much after every event that happens, every player needs to "check in" with how they are responding to the current pace of things. Playing around a table, it's pretty easy to do this, online and in a forum environment, well, it's takes some time. Additionally, it's hard to believe that there are people who moderate this (for free! ), for fun. Again, the rules are are pretty straightforward, but there's a lot of bookkeeping kind of stuff that needs to be taken care of. Kudos to the moderators! Aside from the length of time, it's been a fairly entertaining game, with some pretty good role-playing-ish banter. One particular humorous exchange occurred during a food shortage crisis; during this the President needs to decide between food rationing (which results is discarding cards) or just keep eating (which results in dwindling away at our already dwindled food). President Baltar had already earlier decided on "eating the veal" instead of rationing, which was already leading to him being a cylon traitor. Tigh: "Adama, I'll be preparing the Brig for Baltar if he eats any more of Galatica's food." Baltar: "We're having Caprican rost beef again this week? Well of course I'll take an extra plate, it's not like we're running out of the stuff anyway. Better enjoy fine cuisine now, food rationing will help, but it'll taste terrible ..."
Anyway, things aren't looking very good for our ragtag group of humans at this point. Our food is down to 2, our fuel is down to 1. And we are running out of space to add Cylon ships. One of the things I particularily like about the game is that a player is pretty free to take whatever action he wants (and there are usually a lot to choose from). There's no reason why Starbuck can't waste her time running for President, for example, or have Baltar running around launching and controlling Vipers. However, the special ability modifiers that each character gets really defines what is optimally a better choice for that character to do; Starbuck is much better off flying around in a Viper because she gets an additional action when in a Viper. A lesser game would just say, "she's a Viper pilot, so that's where she is all the time, and here's her list of actions she can take." As another example, I have just gotten done reading the rules to Agricola. While it is a highly rankied game, and well-respected, it has a worker placement rule that annoys me. Players take turns placing their workers on various actions; these actions are then triggered. However, each action can only be triggered once per turn. So, if there's an action that is "bake bread" or "rake leaves" and someone has placed a worker there, a subsequent players can't trigger that action. Why the hell not!? I guess from a game standpoint, there's the strategy of "pick this now before it disappears;" but jeez, why can't I rake leaves just because another player is raking leaves? It's things like this that make me appreciate the "do whatever the hell action you want" ability of BSG so much more. Very often in game design, and game playing, the term of "risk versus reward" comes up often, relating to determining the best course of action. Ideally, as a player you want to make the choice that will give you the best expected value over the long haul of the game. In reality, there is very little inherent to the "risk" part of the equation; the worst that can actually happen is, simply, losing the game. And maybe getting humiliated by your friends; I guess it depends on the crowd you ahng around with. Back in the mid to late 80's, someone tried to re-start the Twilight Zone franchise as a TV series (and again, more recently with Forrest Whitaker as host). But there's something about the old grainy black and white noir look of the old series that adds to the creepiness that the newer, IN LIVING COLOR presentations lack. Anyway, one of the standouts of the 1980's reboot is an episode dealing a gambler in Vegas who has lost everything. He meets a man who offers him $1 million dollars if the gambler can successfully light a cigarette lighter 10 times in a row. Unfortunately, the risk in this case is that the guy offering the deal gets to hack off a finger of the gambler if he is unsuccessful in lighting attempts. Ultimately, the risk/reward ratio here is kind of hard to define; ultimately, the guy is offering the gambler $1 million for a pinkie finger; but he can get the money for free with a bit of skill flicking a Zippo. Unfortunately for the gambler, the build up to the to actual start of the contest does a good deal of spooking him out, involving buckets of ice, wood planks and rope to tie down the gambler's arm, etc. Why bring this up? Well, I've been directed to a risk/reward contest that, while not quite as limb threatening, is all the more devious: TOUR DE DONUT!!! In a simple nutshell, it's a 30 mile bike race. But there are pit stops at the 10 mile and 20 mile marker with lots of donuts. For every donut you eat, you get 5 minutes taken off your time. Or as this website claims: "Each donut eaten at 2 stops along the course brings cyclists either closer to glory or simply closer to a massive stomach ache." Looking through the finishing times of the various bikers also indicates how many donuts they ate along the way. I feel rather disappointed in the bikers who ate none, opting for the race to be a "pure" biking experience. Thankfully, it appears the donut-eaters generally crowd out the top positions. Congrats to Bradley Meinke who won the "Men under 40" division with a winning time of -25 minutes, due to the consumption of 33 donuts along the way.